Fresco making in Rajasthan, particularly in the Shekhawati region, is several centuries old. We do find frescoes in other regions in India, but none can match the perfection of Shekhawati frescoes. Fresco, or Fresh in Italian language, is the traditional medium for painting directly on to the fresh plaster of a wall or ceiling. It is the oldest known painting medium, which normally needs the artist to have a thorough knowledge of arts, mediums and techniques. Also known as the Green method of painting because of the usage of natural pigments, it is a form of mural painting, wherein earth pigments are painted directly on fresh and wet lime plaster. The method of Fresco was a cheaper supplement of marble as the applications impart a smooth and glossy finish to the walls like marble. Fresco’s importance, apart from its permanency, lies in the fact that the floor and walls decorated with it remain cool in summer and warm in winter. This wet process of wall paintings is also known by various names ~ Arayash, Alagila or Morakasi. This ancient medium of paintings has been a great means in India, particularly in Rajasthan, for the inculcation of an appreciation of art as well as the acquisition of knowledge and inculcation of religious feeling. Rajasthan has not only preserved but extended this ancient art tradition into a living form. Shekhawati, meaning “the land of Shekha’s clan” or “the gardens of the Shekha”, is a semidesert region in North Rajasthan and is situated entirely in the triangle between Delhi-Bikaner-Jaipur. It derives its name from Rao Shekha (1433-1488), a part of and scion of the Kachhwaha family of Jaipur. Shekhawati is the land of the rich merchants, or the Marwaris, the Hamptons of Rajasthan and is home to more than 22 richest families in India. Some of India’s biggest business houses have their roots here ~ Oswal, Mittal, Ruia, Lohia, Birla, Dalmia, Goenka, Singhania, Agarwal, Khetan, Modi, Kothari, Jalan, Poddar, Morarka, Jhunjhunuwala and Piramal. The region was a goldmine some 200 years back, as there were huge earnings through outposts for caravans on the Silk Route and the region was once the trading route to the Arabian Sea from the northern plains of India. This rise in the opulence of Marwaris led to the birth of the “Haveli” (palatial home). An era of mass construction of ornately decorated residences thus gave birth to Shekhawati’s art. The size of a “haveli” and the frescoes in it was a measure of the wealth of the owner and provided shelter to their extended family when they were away conducting business. The “haveli”became the symbol of status for a Marwari family and was equivalent to a gadh (fort) for a Rajput. The Land of Shekhawati hence became the home of the largest concentration of frescos in the world, making it the largest open-air gallery in Rajasthan. The region covers almost 5,000 square miles and hosts an estimated 2,000 frescoed buildings built from the 17th to the early 20th century. The antiquity of these “havelis” further improves their charm, turning them into fascinating representatives of past prosperous times the state had witnessed. The “havelis” are the soul of Shekhawati. Generations upon generations of artists and users have pooled their experience to achieve objects of this kind. The “havelis” represent the triumph of the artist over the patron. The frescoes represent the three-dimensional canvases on which a rural imagination has left its imprint. But during the beginning of the 19th century, the Silk Route started getting deserted, leading to migration of the Marwaris to the coastal cities of India, mostly Calcutta and Bombay. 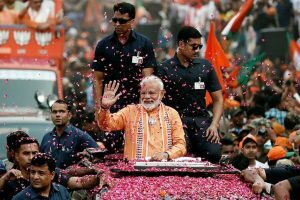 This migration led to the evolution of the big industrialists and rich in India. Most of these Marwaris have now made the big cities their new homes. This led to negligence of the “havelis” as they were left vacant and locked up. The owners rarely visited the homeland save for ritual purposes, especially weddings. “Havelis” suffered years of negligence and many weathered and succumbed to the ravage of time. In recent years, the state government has undertaken some efforts towards spreading awareness about this unique art heritage. Sustainable heritage tourism is being seen as one way of both ensuring the protection and conservation of this art. 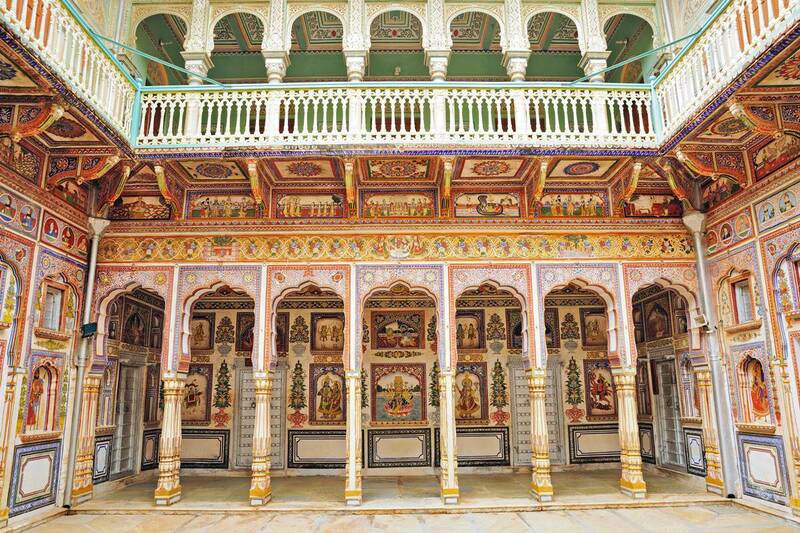 Profusely painted and intricately carved “havelis” of Shekhawati, vying to outdo one another, are now the prime tourist attractions of Rajasthan and indeed one of the most luxurious tourism options of the country. These “havelis” today are a glimpse of the once prosperous storybook region of a bygone era. Fresco painting was a complicated process that involved application of different materials in layers. Multiple layers of processed lime paste were applied followed by a final layer of pigment. Four coats of plaster of purified lime, which was made by a time-consuming process consisting of soaking in water, filtering and mixing it with rice husk, jute fibre, cowdung, gur (jaggery) and methi were normally applied to the walls before adding the colours. Additives were used to make a dense and non sticky plaster paste. Curd was also mixed to make the paste smooth, add shine and render it homogenous. White shell was used as a binding agent in the solution. The plaster paste was known as “Sudha Bandan” or “Panna” and the process was called “Sudha Lape”. Ghinki(marble powder) was also used in the fresco plaster to get more whiteness. The fresco paintings were executed by artists called chiteras, belonging to the kumhars(potters) caste. They were also called chejaras (masons) since they worked both as painters and builders. The paintings, mostly in bright two-dimensional format, were made using only natural colours, like kajal(lamp black) for black, safeda(lime) and kharia(chalk) for white, neel(indigo) for blue, geru (red stone powder) for red, kesar (saffron) and rohira (saffron colour) for orange, pevri (yellow clay) and kesulak for yellow, hara bhata for terra verte, hir mirch for red, kariya for pink colour, khinpe for green, hilkari for silver and gold and so on. Gold leaf was also used at times for rich effect by artists. The chiteras used two methods to make the frescoes. In the first, the “fresco-buono”, painting was done by mixing colours with lime and water and applying them on wet lime plaster to give more stable and lifelong paintings. The wet surface absorbed CO2 from the atmosphere while drying, thereby leading to carbonation of the lime, making the paintings stable and durable. In the second method, “secco” or “fresco-secco”, painting was done on the dry surface of the wall. This tended to fade due to heat, rain and other natural causes. Colours were used with sticking and binding material to enable changes to be made in the painting at a later stage too. One can find frescoes in both styles on the “haveli” walls in Shekhawati ~ the frescobuono method on the outer walls of the haveli while inside the buildings and on the ceiling the secco method was used. Sketching (Rekha Karm) was first done in the form of a rough sketch on paper by punching with a sharp pointed needle or spine after which it was put gainst the wall. Colours are rubbed lightly by hand on this sketch so that it can reach down to the surface. The process was called “Jharna” (Khaka). The final application of paints was then done and the process known as Varn Vyas. The paintings were then rubbed lightly with a soft cloth to check the stability of colour and if needed the walls were again polished with Akaki Stone and coconut to remove impurities. The simplicity and ease with which colours have been used in the paintings of Shekhawati display a great role in giving motion, tone and originality to the work. Most of the Shekhawati frescoes have been prepared in a rectangular form, which imparts continuity in motion. Shekhawati frescoes mostly depict ten broad themes ~ decorative designs, daily life, religion, raga mala, folk mythology, historical events or personalities, flora and fauna, erotica, maps or places and the British and their contraptions. Most chhatris or domes include a rasamandala in the ceiling ~ a dancing circle in which Krishna miraculously replicates himself so that each Gopi finds him dancing next to her. Things changed with the coming of the British. The art form’s usage declined drastically on account of the lack of patronage, and due to the increasing popularity of cheaper variations like cement-plaster, combined with the lack of availability of skilled craftsmen for the fresco technique. Before making plans, it should be noted here that Shekhawati is not a city but a region, which boasts of exquisite craftsmanship and frescoes in architectural wonders called the “havelis”. While visiting Shekhawati, one can stay at heritage properties in Mandawa or Nawalgarh. Accommodation is also available in other towns too. Public transport cannot be relied upon. So it is advisable to have one’s own vehicle to go around and make the most of the region. It takes about seven hours from Delhi to cover a distance of about 300 kms, and less than four hours from Jaipur. The best months to visit are September to March.